／When mirin is heated, its complicated sweetness components form a coat, giving nearly twice as much gloss and luster as sugar. ／When highly permeable alcohol molecules sink into material tissue, they pull in other taste molecules together. While alcohol evaporates in heat, the material tastiness remains. ／When alcohol evaporates, it takes out concealed odor components from materials. Characteristic components of mirin generated by saccharification and maturing also have odor eliminating effect. ／Alcohol sinks in materials, and tightens up on material tissue. ／While sugar sweetness component is only sucrose, mirin contains several sweetness components, including glucose sugar. In order to make the maximum use of the mirin effects for cooking, just use genuine, tasty mirin anyway. If you take a sip and feel good, you have the right mirin. 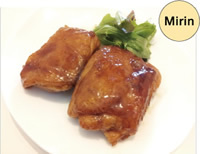 Meat can be softer, juicier and tastier using Teriyaki sauce made of Mirin and Soy sauce than Teriyaki sauce made from Sugar and Soy sauce.